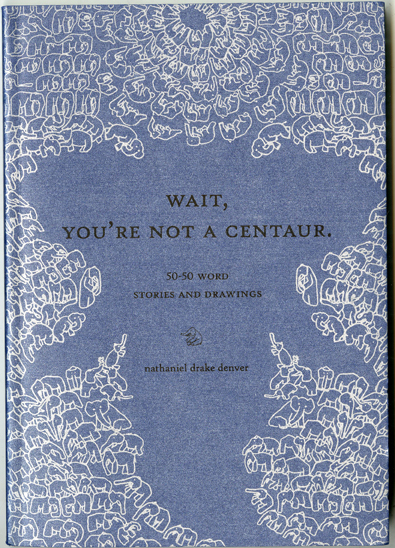 Wait, You’re Not a Centaur. 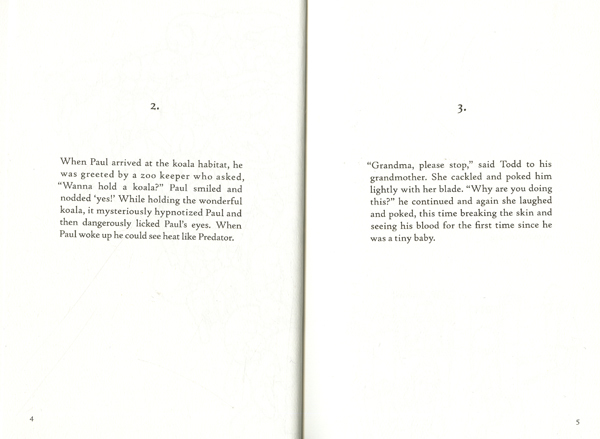 A collection of 50 fifty- word stories by musician/ artist/ writer/ triathelete/ ice cream lover/ renaissance man Nate Denver. At turns scary, sweet, totally bizarre, hilarious, and always heartfelt, these 50 stories read a lot like haiku poems, except, well-- longer. 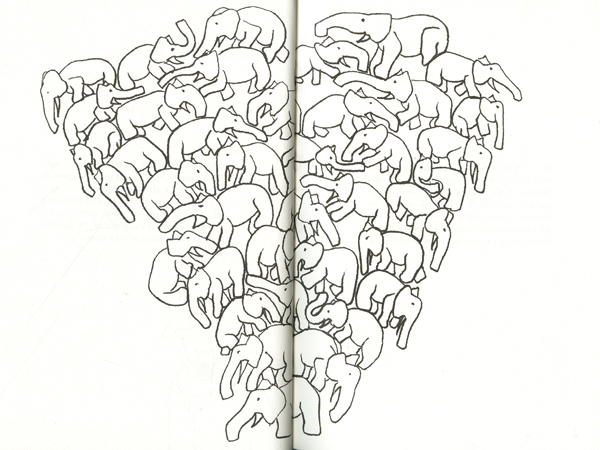 Nate also did a bunch of drawings for the book, and they rule. 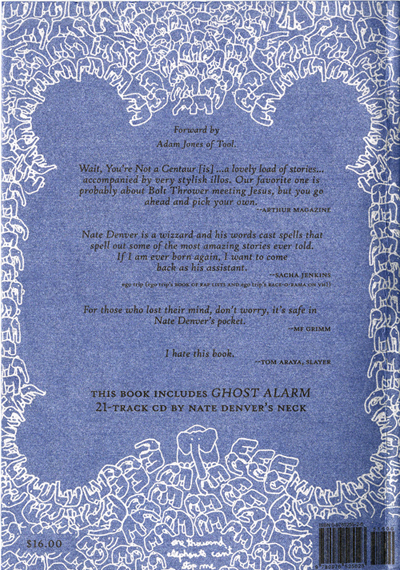 This book also contains a full-length, 21 song CD, "Ghost Alarm", by Nate Denver's Neck (which is, strangely enough, the same guy as the author. go figure.) Introduction by Adam Jones of Tool. 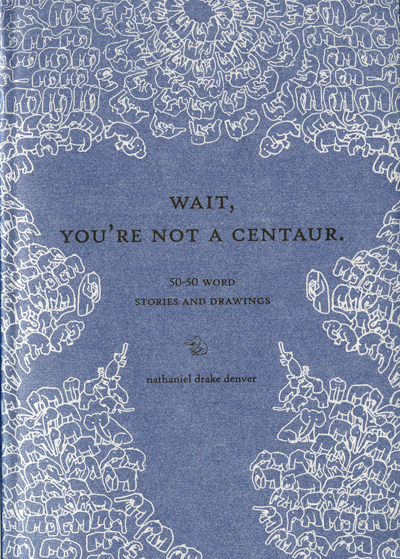 "Wait, You're Not a Centaur" is... a lovely load of stories... accompanied by very stylish illos. Our favorite one is probably about Bolt Thrower meeting Jesus, but you go ahead and pick your own." "Like some dark Gothic automobile, half Panzer tank, half muscle car [...] crashing head on with gratuitous violence into a wall of art & humor/death & destruction, Nate climbs out as one of the four Horsemen of the Apocalypse, brandishing a guitar shaped like an oversized medieval axe and carrying a white kitten dressed as a matador named 'Trevor'. Artist. Writer. Composer. Musician. Performer, and an upright citizen to boot... this book is truly inspiring."